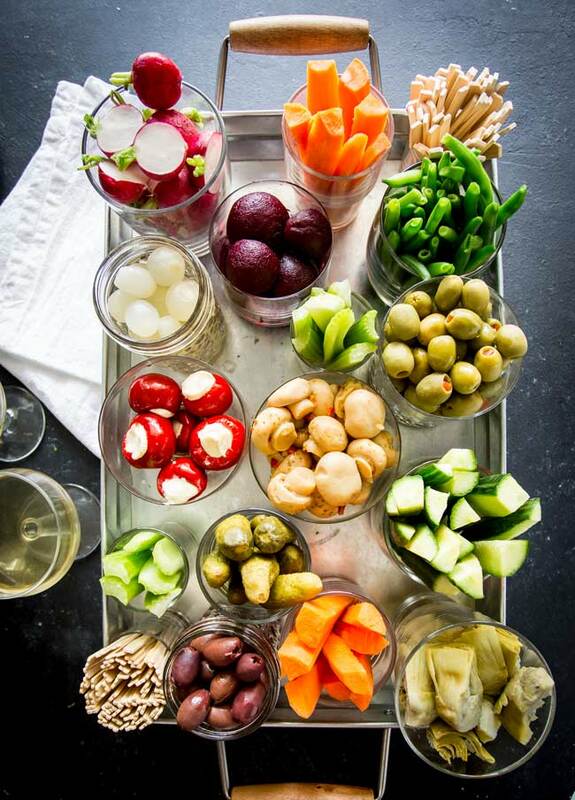 If you want an easy appetizer for the holidays then this modern relish tray is a simple and unique party idea. Learn what to put on a relish tray, how to make it look gorgeous. 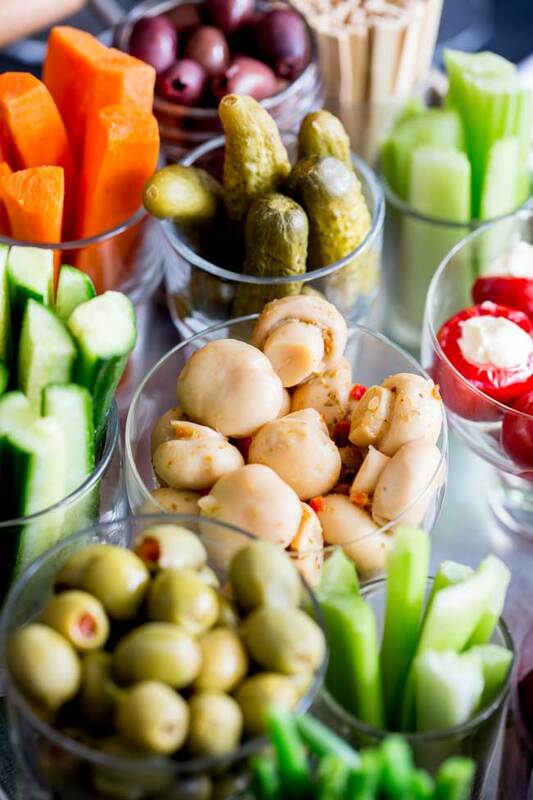 Whether you are using a traditional or vintage relish tray or want to make a fancy veggie platter, this guide will show you how your tray can be more than just olives and the odd pickle. The perfect appetizer before the Thanksgiving turkey! 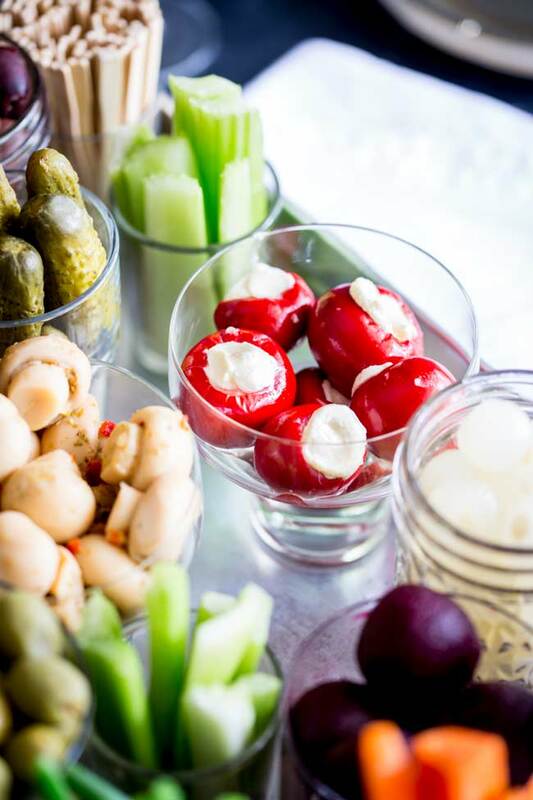 A relish tray may seem a bit last century, but this easy nibble platter is actually bang on trend!!! 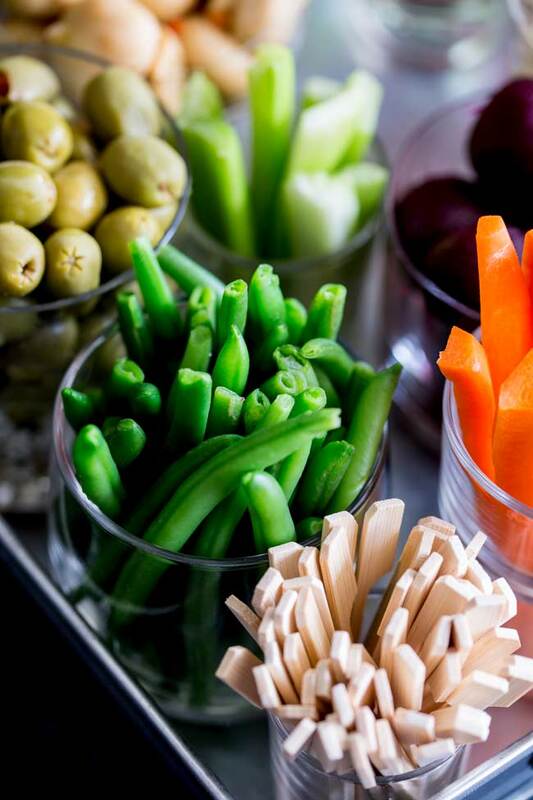 Think about all the grazing plates, grazing tables and grazing platters that are everywhere on Pinterest and Instagram, they all have roots in the original relish tray! Turns out our grandmas were on trend and ahead of their time! What tray to use as a modern relish tray? Now that doesn’t mean we need to take trips to the thrift store to source a compartmentalized crystal dish. By all means, if you have one then wheel it out and fill it. But today’s modern relish trays can really just be a tray! I used a metal drinks tray that I bought in Walmart/Kmart. You could find a beautiful wooden tray, or make your own using a picture frame like this one from Christy over at Confessions of a Serial Do-it-Yourselfer. Once I had my tray it was just a case of raiding my glasses cabinet! I have red/white glasses, champagne flutes, whisky glasses, margarita glasses, martini glasses, G&T highballs all nicely organised. Then there is that one shelf, the shelf that is home to all of the mismatched random glasses. Ones that use to be a set but the kids (or myself) have smashed one or two. Odd glasses that I have found in thrift stores and car boot sales. Cute glasses that held preserves and chutneys. Just various shaped and sized glasses that are perfect for the modern relish tray. Just look at the above picture! I have a crystal glass, some shot glasses, a champagne saucer, some mini mason jars and some super cheap Ikea glasses. They are all different shapes and heights, and together they make a gorgeous and interesting looking tray. Or if you have 12 matching glasses try that for a uniformed look. If you don’t have enough glasses, intersperse them with ceramic ramekins, old jam jars or candle votives. Anything that can hold your delicious morsels of food. Takeaway Point: Use any tray you have and use mismatched glasses or dishes to create a fun eclectic look. What to put on a relish tray? Traditionally our Grandmas had black olives, crinkle cut bread & butter pickles, pickled onions, radishes, carrot sticks, celery sticks, cucumber batons and maybe some pickled beets. All great things to include. As well as these I like to mix it up and add a variety of other nibbles, some homemade and some store bought. Cream cheese stuffed cherry peppers. You can buy them pre-stuffed from the deli counter or buy them in a jar and stuff them yourself. The olives here are a mixture of purple kalamata olives and stuffed green olives. Some of those oversized Sicilian olives would also be perfect! There’s picked mushrooms, dressed with a little red pepper flakes. I bought mine from the deli counter but you could use my mushroom bruschetta mixture instead. Artichoke hearts drizzled with garlic oil. I buy them in a tin and then dress them myself but you can find dressed artichoke hearts at the deli counter. Lightly pickled green beans. I use this recipe. I swapped out the bread and butter pickles for some mini gherkins. I like to pop them in some small shot glasses and put them directly on the tray. That way guests can easily see them and you are all ready to serve when the tray comes to the table/sideboard. Serve some chilled sparkling wine and let the festivities begin! Why not pin Relish Tray ‘How-to’ for later. Pin it here. 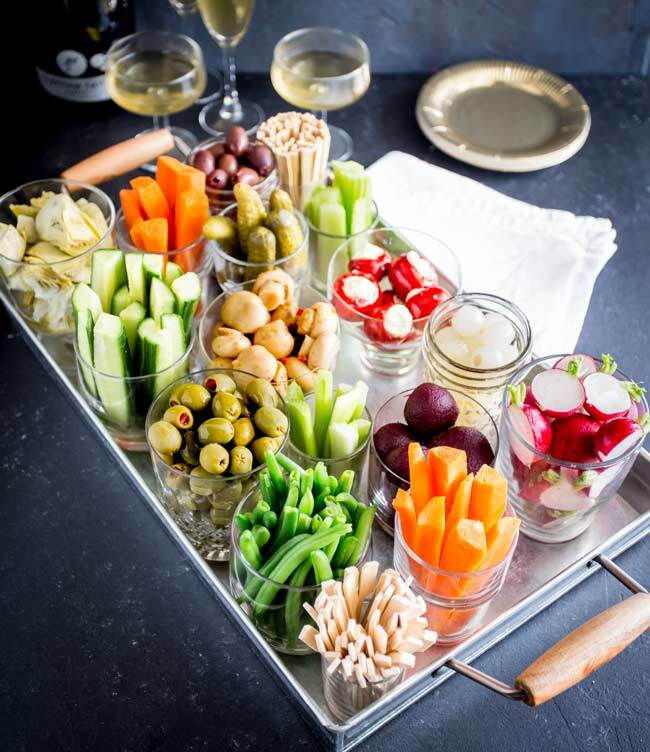 If you want an easy appetizer for the holidays then this modern relish tray is a simple and unique party idea. Learn what to put on a relish tray, how to make it look gorgeous. 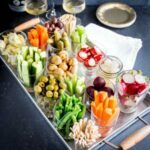 Whether you are using a traditional or vintage relish tray or want to make something a fancy veggie platter, this guide will show you how your tray can be more than just olives and the odd pickle. The perfect appetiser before the thanksgiving turkey! You can use any tray you like for your relish tray. Go traditional with a compartmentalised crystal dish. Use a metal drinks tray, a beautiful wooden tray or find a large platter. Raid your glasses cabinet for a mixture of glasses, intersperse them with ramekins and maybe some small metal bowls for an eclectic modern look. Halved radishes - Leave a little bit of green on the top to add interest. Cream cheese stuffed cherry peppers - You can buy them pre-stuffed from the deli counter or buy them in a jar and stuff them yourself. Purple kalamata olives and stuffed green olives. Or some of those oversized Sicilian olives would also be perfect! Picked mushrooms or a mushroom bruschetta mixture. You can buy these from the deli counter or see note 1 for a link to a recipe. Artichoke hearts drizzled with garlic oil. Lightly pickled green beans. See note 2 for a link to a recipe. This recipe for Mushroom Bruschetta makes a great add-on for the relish tray. This is my favourite Pickled Green Bean Recipe. Is there any dip you might suggest to serve alongside this? I would serve something like a cream cheese and chive dip, french onion dip or maybe a roasted eggplant dip.